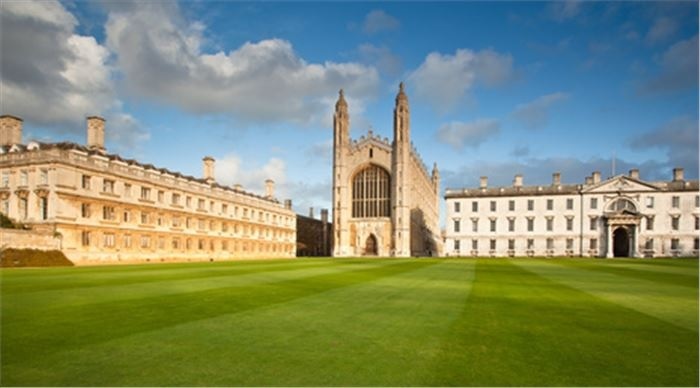 Authors: Slavko Bogdanov, Adam T. Deller, James C. A. Miller-Jones, et al. What’s more interesting than a rapidly spinning neutron star that emits electromagnetic radiation parallel to its magnetic poles? One that doesn’t exactly behave as expected, of course. One such weirdly acting pulsar, PSR J1023+0038, is a transitional millisecond pulsar (tMSP) — which is fancy speak for a pulsar with a millisecond rotational period that switches between radio and X-ray emission on a several-year timescale. The fact that this pulsar emits in both X-ray and radio on these longer timescales isn’t what piques the interest of astronomers, however, in the case of the study in this astrobite. 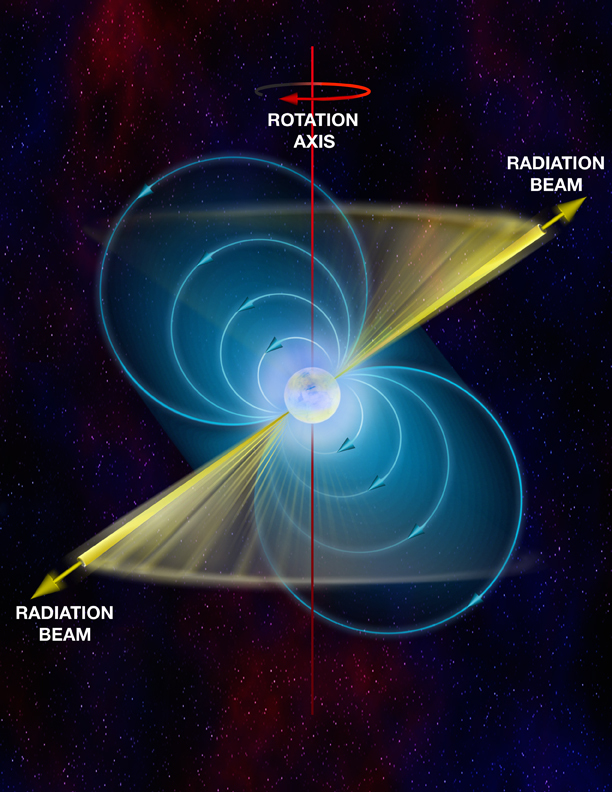 Pulsars can typically fall into one of the following categories: radio pulsars are powered by exchanging rotational energy from the spinning neutron star into emitting radiation. This means that their rotation slows and their pulse length increases. Meanwhile, X-ray pulsars are accretion powered, meaning they turn heated infalling matter into X-ray emission. What distinguishes PSR J1023+0038 from the background of pulsars that switch between accretion-powered X-ray and rotation-powered radio pulsars is that it has a simultaneous anti-correlated X-ray and radio emission. 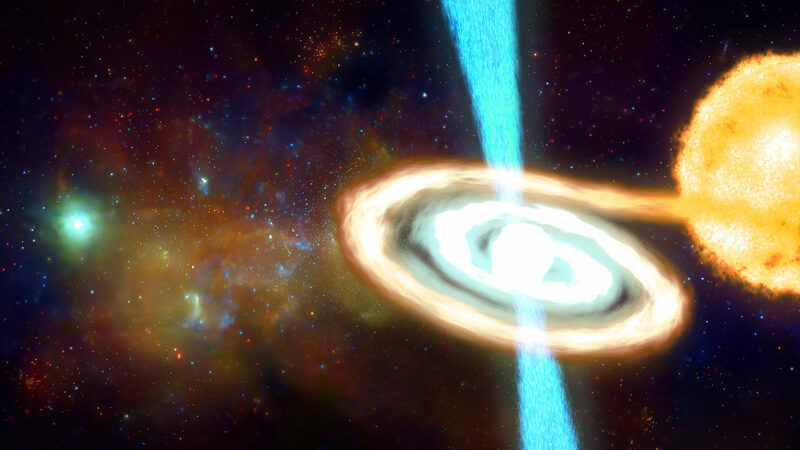 The authors looked at about 5 hours of overlapping and concurrent observations from the Chandra X-ray Observatory and the Very Large Array (VLA) to try and understand this weird relationship between the X-ray and radio emissions. This is very clearly shown in Fig. 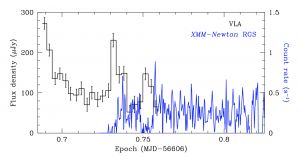 1 where we can see a tiny sample of time of overlapping X-ray and radio flux measurements. 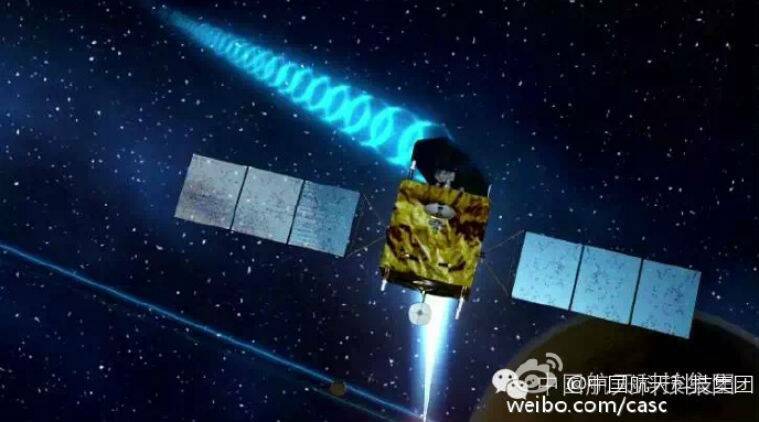 The anti-correlation is quite strong, meaning that when the X-ray emissions are weakest, the radio emission is strongest. Figure 1: Radio emissions (black) and x-ray emissions (blue) recorded by the VLA and Chandra respectively over time. This shows that when radio emissions drop off, X-ray emissions pick up. 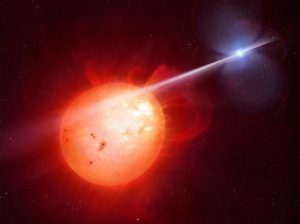 A little bit of “scruff” in scientific data 50 years ago led to the discovery of pulsars – rapidly spinning dense stellar corpses that appear to pulse at Earth. 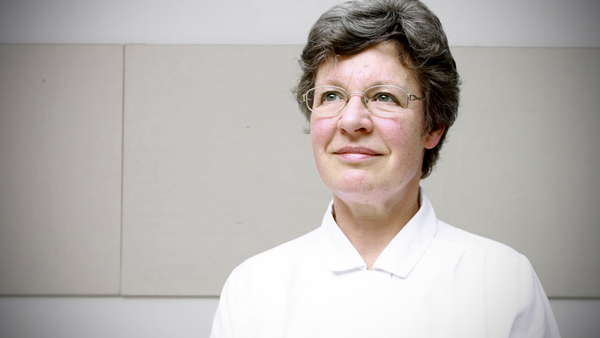 Astronomer Jocelyn Bell made the chance discovery using a vast radio telescope in Cambridge, England. Although it was built to measure the random brightness flickers of a different category of celestial objects called quasars, the 4.5-acre telescope produced unexpected markings on Bell’s paper data recorder every 1.33730 seconds. Most known neutron stars are observed as pulsars, emitting narrow, sweeping beams of radiation. They squeeze up to two solar masses into a city-size volume, crushing matter to the highest possible stable densities. To explore these exotic states of matter, NICER measures X-ray emissions across the surfaces of neutron stars as they spin, ultimately confronting the predictions of nuclear physics theory. The Neutron star Interior Composition Explorer, or NICER, is the first NASA mission dedicated to studying pulsars. In a nod to the anniversary of Bell’s discovery, NICER observed the famous first pulsar, known today as PSR B1919+21. NICER launched to the International Space Station in early June and started science operations last month. 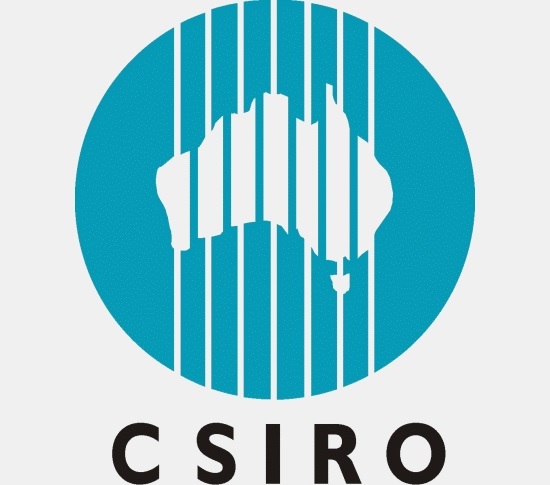 Its X-ray observations – the part of the electromagnetic spectrum in which these stars radiate both from their million-degree solid surfaces and from their strong magnetic fields – will reveal how nature’s fundamental forces behave within the cores of these objects, an environment that doesn’t exist and can’t be reproduced anywhere else. “What’s inside a pulsar?” is one of many long-standing astrophysics questions about these ultra-dense, fast-spinning, powerfully magnetic objects. NICER is currently installed on the International Space Station. This turntable animation of the payload calls out the locations of NICER’s star tracker camera, electronics, space station attachment mechanism, 56 sunshields, pointing actuators and stow/deploy actuator. The mission will also pave the way for future space exploration by helping to develop a Global Positioning System-like capability for the galaxy. The embedded Station Explorer for X-ray Timing and Navigation Technology, or SEXTANT, demonstration will use NICER’s X-ray observations of pulsar signals to determine NICER’s exact position in orbit. Scientists have tested this method using computer and lab simulations. SEXTANT will demonstrate pulsar-based navigation for the first time in space. NICER-SEXTANT is the first astrophysics mission dedicated to studying pulsars, 50 years after their discovery. “I think it is going to yield many more scientific discoveries than we can anticipate now,” said Gendreau. NICER-SEXTANT is a two-in-one mission. NICER is an Astrophysics Mission of Opportunity within NASA’s Explorer program, which provides frequent flight opportunities for world-class scientific investigations from space utilizing innovative, streamlined, and efficient management approaches within the heliophysics and astrophysics science areas. NASA’s Space Technology Mission Directorate supports the SEXTANT component of the mission, demonstrating pulsar-based spacecraft navigation. 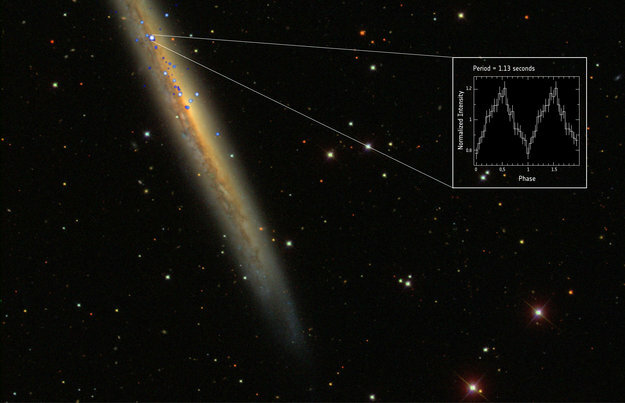 An accreting pulsar with extreme properties drives an ultraluminous X-ray source in NGC 5907 by G.L. Israel is published in Science. NASA’s Chandra X-ray Observatory has taken deep exposures of two nearby energetic pulsars flying through the Milky Way galaxy. The shape of their X-ray emission suggests there is a geometrical explanation for puzzling differences in behavior shown by some pulsars. Pulsars – rapidly rotating, highly magnetized, neutron stars born in supernova explosions triggered by the collapse of massive stars- were discovered 50 years ago via their pulsed, highly regular, radio emission. Pulsars produce a lighthouse-like beam of radiation that astronomers detect as pulses as the pulsar’s rotation sweeps the beam across the sky. This four-panel graphic shows the two pulsars observed by Chandra. Geminga is in the upper left and B0355+54 is in the upper right. In both of these images, Chandra’s X-rays, colored blue and purple, are combined with infrared data from NASA’s Spitzer Space Telescope that shows stars in the field of view. 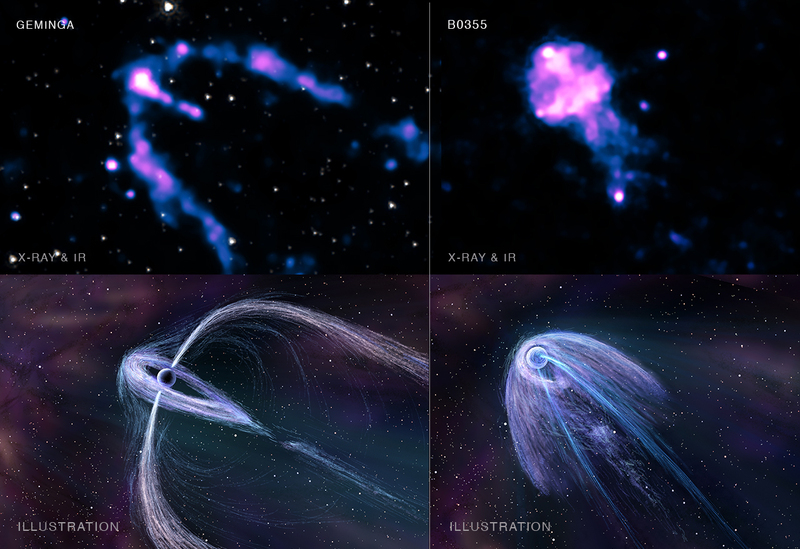 Below each data image, an artist’s illustration depicts more details of what astronomers think the structure of each pulsar wind nebula looks like. A likely interpretation of the Chandra images is that the long narrow trails to the side of Geminga and the double tail of B0355+54 represent narrow jets emanating from the pulsar’s spin poles. Both pulsars also contain a torus, a disk-shaped region of emission spreading from the pulsar’s spin equator. These donut-shaped structures and jets are crushed and swept back as the pulsars fly through the Galaxy at supersonic speeds. Both pulsars have magnetic poles quite close to their spin poles, as is the case for the Earth’s magnetic field. These magnetic poles are the site of pulsar radio emission so astronomers expect the radio beams to point in a similar direction as the jets. By contrast the gamma-ray emission is mainly produced along the spin equator and so aligns with the torus. 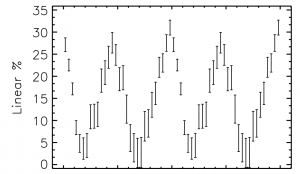 A paper on Geminga led by Bettina Posselt of Penn State University was accepted for publication in The Astrophysical Journal and is available online. A paper on B0355+54 led by Noel Klingler of the George Washington University was published in the December 20th, 2016 issue of The Astrophysical Journal and is available online. Pulsars – the rapidly rotating, highly magnetized neutron stars that beam radiation from their magnetic axes — are as mysterious as they are exotic. They’re most often observed at radio frequencies using single-dish telescopes, and are sometimes glimpsed in X-ray and gamma-ray bands. Far rarer are pulsar observations at “in-between” frequencies, such as ultraviolet (UV), optical, and infrared (IR) (collectively, UVOIR); in fact, only about a dozen pulsars have been detected this way. However, their study in this frequency range has proved enlightening, as we will see in today’s post. While one would expect a neutron star to cool with age if an internal heating mechanism does not operate throughout its lifetime, observations of the millisecond pulsar J0437–4715 (an interesting object in its own right) yielded surprising results. In a 2016 study, far-UV observations revealed the 7-billion-year-old pulsar to have a surface temperature of about 2 × 105 K — about 35 times the temperature of the Sun’s photosphere. This finding inspired Rangelov et al. to observe another millisecond pulsar, J2124-3358 (a 3.8-billion-year-old pulsar with a spin period of 4.93 ms), in the far-UV and optical bands using the Hubble Space Telescope (HST). Because so few pulsars have been studied in these frequency ranges, their spectral energy distributions (SEDs) in this regime are poorly understood. Generally speaking, the spectra of normal, rotation-powered pulsars reveal a nonthermal (not dependent on temperature) component in optical and X-rays caused by electrons and positrons in the pulsar magnetosphere. In the far-UV, some pulsars show a thermal (blackbody) component in their spectra, thought to come from the surface of the cooling object. Analysis of the team’s HST images revealed an SED that is best modeled by a combined nonthermal and thermal spectral fit, with nonthermal emission dominating at optical wavelengths and thermal emission appearing in the far-UV (see Figure 1). If their interpretation is correct, this implies a surface temperature for J2124-3358 that is between 0.5 × 105 and 2.1 × 105 K, which is very much in line with the temperature of J0437-4715. If this proves to be the case, these two measurements will strongly suggest the presence of a heating mechanism in millisecond pulsars. However, various fits using only nonthermal components in the far-UV are still valid, so it is impossible to make an absolute determination of the correct fit. There are quite a few heating mechanisms that could be invoked to explain these objects’ high temperatures, ranging from the release of stored strain energy from the pulsar’s crust to dark matter annihilation in the pulsar’s interior. More spectral coverage of J2124-3358 is necessary to both check the validity of the nonthermal and thermal combined fit and to get closer to determining more specifically the heating mechanism in play. Figure 1: Thermal (red dashed) and nonthermal (blue dashed) combined spectral fit to HST far-UV/optical data for J2124-3358. The black line signifies the sum of both components. Because there is uncertainty about the nature of the nonthermal component, two possible spectral slopes are shown. Figure 7 in the paper. Images of J2124-3358 also show the presence of a bow shock, which is an arc-shaped shock that occurs when an object is moving faster than the interstellar medium (ISM) sound speed. J2124-3358 was known before this study to be accompanied by such a shock in H-alpha (Hydrogen transition from n=3 to n=2) filters, for which plenty of neutral hydrogen is required. As a result of the HST observations, J2124-3358 was found to have an (albeit fainter) far-UV shock coincident with the H-alpha shock (see Figure 2). This is only the second such object (after J0437-4715) to show a far-UV bow shock. It is absolutely possible that many pulsars cause bow shocks that don’t emit in H-alpha, but do in other wavelength regimes. Studying these more carefully will yield information about the nature of the ISM. In order to learn more about the heating mechanisms operating in these objects as well as the bow shocks that sometimes accompany them, many more pulsars will need to be studied using various optical, UV, and IR filters. Studies in the far-UV are only possible with Hubble, so it will be a long time before a sufficient number of objects will be studied at these frequencies in order to make solid conclusions about the nature of such interesting phenomena. 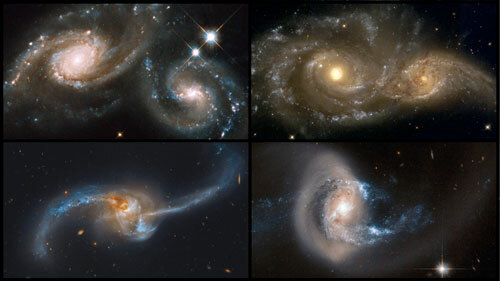 Figure 2: New observations of J2124-3358 from this study using the HST at three different wavelengths are shown in the top (left and right) and bottom left images. The shock is clearly visible in the far-UV using the F125LP filter. 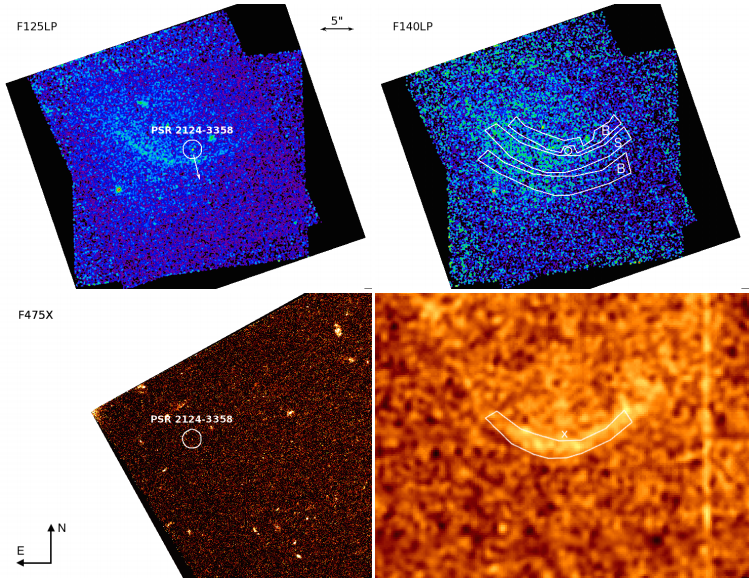 The bottom right image shows a previous H-alpha observation of the same pulsar. Figure 1 in the paper.